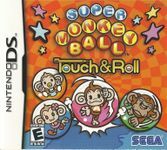 Use your stylus and the Nintendo DS touch screen to roll your monkeys to the goal! Guide AiAi, GonGon, MeeMee, and Baby through 100 puzzling new stages with the touch of your stylus. Challenge your friends wirelessly - up to 4 players can roll through classic party games. 2 All new party games - frantic Monkey Wars and fast-paced Monkey Hockey!"